Recent hype has surrounded a camper conversion once owned by Steve McQueen, and while he certainly was a legend, the car is just another Chevy pickup with a camper conversion. Nothing to see, move along please. Move right along to the strangest camper you'll find on the web. 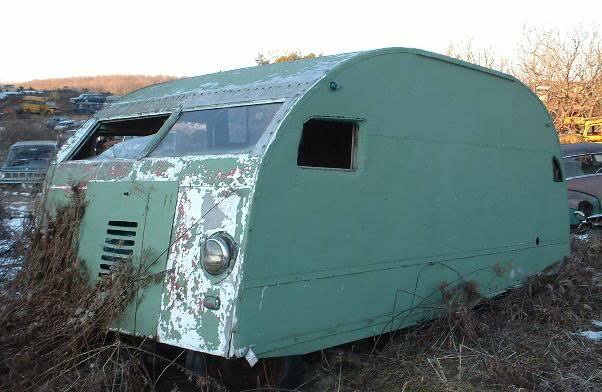 This is a 1935 Graham Housecar, for sale in Mohawk, NY for $5,500 buy-it-now or best offer on ebay. A quick search of the internet turns up little info on the Graham Housecar, but reveals that this...vehicle has been for sale from the same junkyard in upstate New York since at least 2010. Ebay doesn't include price information from the old listings, but we can only assume the price has dropped since its current asking price isn't a king's ransom. The only thing we do know about this crazy looking thing is that it was allegedly built on a Chrysler chassis, but it is an enigma and we're not even sure where the engine is on this thing. It could be a homebrew special; either way it certainly is "special." That is conceptually kind of cool. Verging on theoretically really cool. Except that there is nothing there except the shell, and a bunch of scrap timber inside. And the shell is the easiest part to replicate. Not a compound curve in sight. What it makes me want to do is build a self powered vintage Airstream, kind of one part Airstream, one part Dimaxion car. McQueen was a legend and for you to write about it even more special! I'd love to have that 52 Chevy camper! Looks like a WW1 tank. Apparently blind spots were not much of a concern on the Lincoln highway in the 1930s. Here in the piney woods of South Carolina, that baby is in move-in condition! I personally don't believe this vehicle ever existed ! This is someone's scam, purchase at your own peril. Cool idea, though. I might really do this myself in the future.